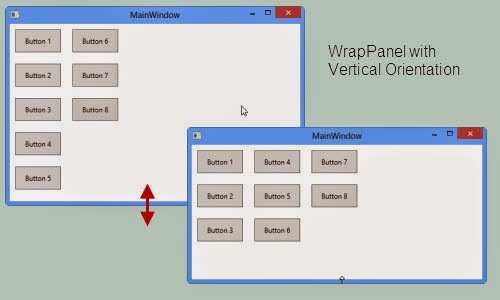 WrapPanel is much similar to Stackpanel because WrapPanel stacks child elements side by side or stack to each other. In addition, WrapPanel wraps the Child elements to the next row or column when there is no available space. Let's create various layout using WrapPanel. 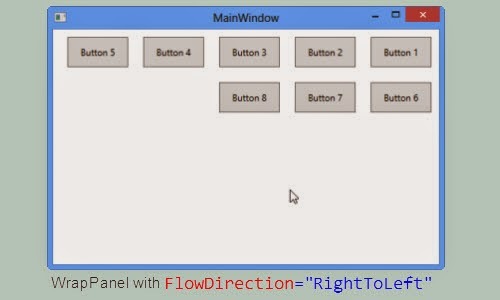 Example: Creating Simple layout using Wrapanel. Default Orientation of WrapPanel is Horizontal and child elements are arranged from left to right direction. ItemHeight and ItemWidth property of WrapPanel sets uniform height and width of Child Elements. If we reduce the size of Window then Child Elements moved to Next line/Row. Setting Orientation as vertical arranges Child Elements from top to Bottom and if neccessary, child elements moves to next Column. When we change WrapPanel's FlowDirection property to Right to left, then stacking of child elements start from right to Left . The default behaviour is LeftToRight. 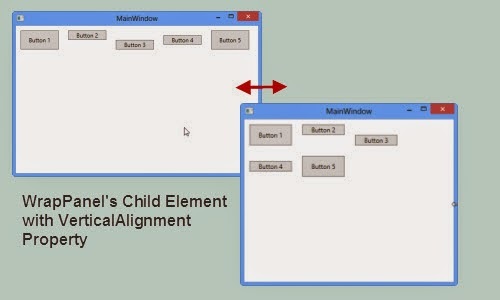 Example: Setting VerticalAlignment Property of Child Elements in WrapPanel with Horizontal Orientation. We can also adjust VerticalAlignment Property of Child Elements in WrapPanel with Horizontal Orientation and vice-versa.